Rotten eggs, cat urine, bitter almonds—that’s the delightful elixir of aromas comprising the BO of one comet 67P, also known as Rosetta’s comet. In a heartwarmingly nerdy yet mildly alarming development, members of the Rosetta mission team have commissioned scent firm The Aroma Company to turn it into a perfume. Yes, you heard that correctly. 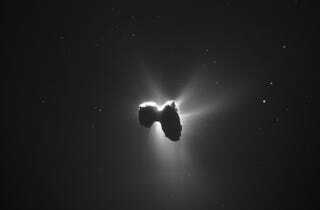 The deathly stank of comet 67P, inspired by the hydrogen sulfide, ammonia, and hydrogen cyanide Rosetta’s Philae lander sniffed before swiftly dying on the space rock’s surface (and now we know why) is finally an eau de toilette. Colin Snodgrass, the scientist behind the harebrained scheme, plans to impregnate postcards with the scent and ship them to the far corners of the Earth so that all humans can begin to appreciate just how terrible their solar system smells. A reporter at New Scientist recently got an exclusive whiff of comet 67P. He describes it as “sharp” and “unpleasant,” likening it to a “physical presence” inside his skull. The Rosetta mission team, meanwhile, is a bit fonder of the concoction, comparing it to the scent of a lily. Gizmodo can neither confirm nor deny rumors that said lily grew out of a dumpster full of used diapers. If these conflicting descriptions are unsatisfactory, you can discover what Rosetta reeks of firsthand by picking up a free sample of the perfume at the Royal Society exhibition in London this summer or by getting your hands on one of those postcards. I, for one, am going to hold out for eau de Uranus.